I am an amateur seamstress. Although I really enjoy it I am not good enough to invest serious money in it and all the supplies add up fast. So, when I see them at the thrift store I buy them to save for whatever project comes next. Above you can see 5 packs of machine needles. I don't know much about which ones to use on which fabrics, but at least now I have the supplies when (if) I figure it out. A bonus in the bag of supplies was the Coach measuring tape. Why Coach makes a designer measuring tape is beyond me, but I am hoping to make some money with it on Ebay. I saw one recently for sale for $40. That definitely would reimburse my $1.99 investment in sewing supplies. I love dressing my daughter in vintage dresses. As she gets older it gets harder to find ones in good shape (or at all for that matter). I hit the jack pot the other day. Someone either off loaded some long-held-on dresses or another vintage collector donated some of their collection. All three were right next to each other on the rack and all are size 6, the next size up for my daughter. Plus they were each 50% off making them $1.99 each. I really don't like the "collectibles" section of my local Goodwill. Seems like they take all the good stuff and price it so high its no longer worth buying. Also some things in there are just way over priced in general, even though they are not really that great. I saw a Starbucks water bottle for $12.00! That is approaching the new price and trust me it was not in new condition. However I do usually browse through and look at the jewelry. Recently I found the above Pyrex dish in that section. It was priced high ($15) but I decided to splurge because I loved the color. I am a big believer in balance bikes. My son got one for Christmas when he was 2 1/2 and by the time he was 3 he was amazing at it - cruising around, turning corners, stopping well. Once my daughter saw how much fun he was having she insisted on one as well, even though she was older. I didn't want to pay retail for a balance bike for her since she would only use it for awhile, but thought it might help her get onto a regular bike sooner. I found this one at the thrift store for $4.99, which seemed like the right price. Its not the best quality bike, but well worth it for $5. We have since found another one which adjusts to a level that better fits Hannah so I am planning on selling this one. Yoga supplies new in the box at the thrift store. Includes a strap and block, which I being a newbie, am usually in need of. I usually prefer to take my classes at the Y, but recent events have made it more difficult to get there. I have yet to open the box (as you can see) but I think I could get into yoga at home. Plus they match my mat, which is just a bonus. You can almost make out the price tag in the picture - $1.99. Not an amazing deal since they retail for only about $10, but its new and I didn't have to go to Target to get it. This is not supposed to be a blog entirely about strollers, yet somehow that seems to be what its ending up as. We recently added another 1 year old to our family via the foster system. We had previously sold our double stroller when our middle child got old enough to walk to the park. My sister in law (also very thrifty) scored this BOB double jogging stroller for free. It's a very nice stroller, but in bad shape. It needed quite a bit of work and it wasn't something she wanted to invest her time in so she passed it on to me. It sat on our back porch for awhile until it our newest little one arrived and we truly needed it. Dan and I were able to fix it up with one evening's work. He fixed the breaks, inflated the tires, cut off the shredded handlebar pad and replaced it with some bike handlebar tape. I stitched up every tear I could find and scrubbed off the mildew. We managed to totally take apart the top piece and wash the cover in the washing machine. I'm pretty happy with the results. Its obviously used, but still a great stroller which works great. Since this retails for $500 and it only costs us a couple hours work I think it was well worth it. No great finds at the thrift store today. I had such a good run off luck around the holidays when there was so much turn over in merchandise, which was actually the inspiration to re-start my blog. Now its back to average. However its still where I buy most of my stuff. In this picture there is a pretty cute necklace ($1.29), a bag of little animals and a crayola marker/special paper set ($1.29 each). I bought these little toys primarily for my road trip/boring adult event box. When I find something that will occupy my kids and is small and easily packed I will pick it up and throw it in the box. Next time I now I know I will need something to occupy them I can dig through the box. I also bought a new sippy cup. We have a foster child in our home who will be moving on soon (have I mentioned I am a foster parent?) and he is in need of a cup for water. I wanted to get him one that he could take with him when he goes so the thrift store was best - $.99. 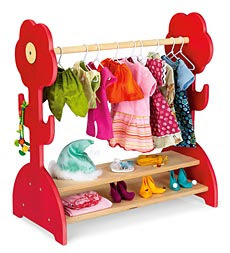 Found this cute little doll clothes rack at Goodwill super cheap - $1.99. It retails for a lot more ($49.99). When I looked it up online I was so impressed at how cute they made it look in the pictures. Reality is not turning out so well. I am not sure why I thought my daughter would nicely hang up her doll clothes. Also we have way too many accessories for this thing. I think I may try to sell it, but now I have given it to my daughter and will have convince her to give it up. We'll see how successful I am. I know I just recently said Lego sets are hard to come by especially new, however my husband was lucky enough to find another set new in the box. It has all the pieces still in their bags with the decal stickers and instruction book. He got it at the Lifelong Aids Thrift Store in Capitol Hill for $2.99. A good deal considering they retail for around $15. It will be a birthday present for my oldest son whose birthday is coming in March and who luckily does not read blogs. Another not so thrifty find. I would feel more confident about this find if it had been a whole set of powder blue canisters, but sigh, it was only flour. Still in good shape and added some color to our kitchen. We put it on our open shelves to hold coffee beans. Paid $4.99, again not such a great price, but still kind of cute. Cute little vintage purse. I mostly bought it because, well I love vintage bags of all kinds, but also because I have very fond memories of a red bag, much like this that I had when I was a kid. I used to carry it around a lot. I left it at a Taco Bell and never got it back. Now I have a duplicate to relive my childhood, which to be honest is what my love of vintage goods is really about. I did pay too much and I knew it at the time - $9.99, but you can't put a price on nostalgia. Another one of those weird little finds. You gotta know what you're looking at to be able to tell its a good deal. I am sure I pass many things at the thrift store that others are amazed to find, but baby stuff is my forte. This is a little clip on high chair. It folds completely flat, which is great for traveling and storage and is adjustable to fit most chairs. We've had a rather ugly plastic booster seat for our littlest guy (another thrift store find, of course) so this is an improvement. Cost was $3.99. Its called the Wonderworld Handysitt and retails for $130. I am hopeful I can resell it for a profit when we're done using it as well. I have blogged about this cookbook in the past, but I recently found it again at Goodwill. That makes about 5 copies I have found over the years. It is one of the most collectable Betty Crocker Cookbooks out there and this one is in great shape. It looks new and is shrink wrapped. I know it could have been shrink wrapped at some point in the past, but it could also be the original wrapping, which would make it an amazing find. I don't know enough about these books to be able to tell and a preliminary google search turned up no answers. In the meantime I am keeping it shrink wrapped and keeping it on the shelf. Maybe I will be able to turn up some answers at some point in the future. This copy cost me $4.99. We've got a great city view outside of our front window and an oddly shaped living room that makes it hard to put furniture there so we can enjoy it. Additionally my middle son started a preschool that has a bus this fall and so needed to spend the mornings watching for his bus. So I have been on the look out for a kid's table to put there. Again I searched craiglist on and off, but couldn't find anything that I wanted in my living room that was the right price. Then at Goodwill I found this cute bright blue table and chairs set. It was spray painted, but I think whoever did it did a fairly good job and I love the color. I set a bucket of colored pencils there and I have been amazed at how much drawing my kids have been doing as a result. I guess having a place for them to do it was the key. I paid $10 for them. I ended up spending more on the pencil sharpener I put on the table then the table itself.